It may not sound like a disease, but to a teenage child or young adult, acne can be the curse of genetics, stress, diet or hormone levels and can lower self-esteem during a crucial time of life. If one or both parents of a child had acne when they were growing up, odds are that they will as well. Call it fate, but it still doesn’t alleviate the psychological feelings that go along with having acne. This in turn can cause one to incur greater stress and anxiety, another probable cause of breakouts. Teenage years, stress and social pressures can lead to unhealthy food choices, hence drive through fast foods, again instigating more breakouts. On top of everything, hormone imbalances, especially excess testosterone lead is the most common cause of again, more breakouts. It can a vicious and frustrating cycle trying to figure out the cause of acne. Acne can appear in many ways and give clues as to cause. For instance, little tiny bumps all over the face is usually an indicator of an allergy. 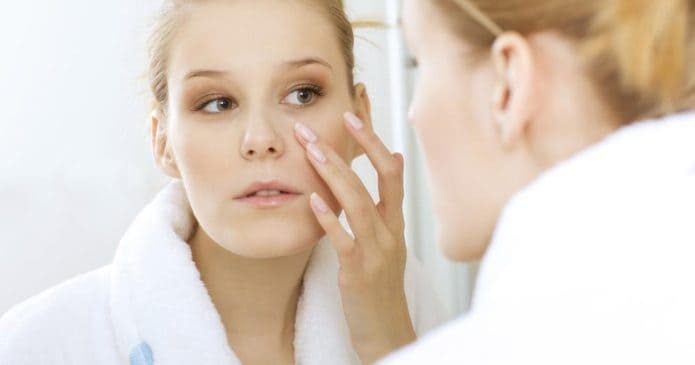 Fragrance, which is in many cosmetic and facial products, including the soap, is the biggest culprit to this type of acne. Of the four thousand chemicals under the heading of “fragrance,” about 80% of them have not been tested and may be carcinogenic (Clement, C. E., 2005). Fragrance sensitivities, are of the top five topical allergens and are linked to chronic dermatitis, especially in males (Gupta, N., Shenoi, S. D., & Balachandran, C., 1999). Using fragrance free hair and skin care products is a recommended easy fix. If a fragrance is preferred, essential oils are the natural way to stimulate the scent senses. Stress breakouts usually show on the forehead. Practicing meditation and yoga or finding some manual therapy, art or music therapy, will aid in stress reduction. This type of acne is not just applicable to teenagers, but to many adults as well. Cheek acne or cystic pustules are a big indicator of diet. Something is amiss with the digestive system. Too much meat, dairy or gluten can have effect on the digestive tract and bowels. This is when dietary council and supplementation come into play. Retinol (Vita A), Zinc, Vitamin E and selenium (Murray, M. & Pizzorno, J., 2012), as well as Magnesium and a pre and probiotic will help with the inflammatory and digestion. Topicals such as tee tree oil, benzoyl peroxide and other acids helps the epidermal layer heal. Topical herbal ingredients can include basil for its antimicrobial properties, chamomile for calming inflammation, licorice root and bilberry extract to help with pigmentation and scarring surrounding the pustules. As most dermatologist first turn to prescribing antibiotics, oregano oil has shown to have similar benefits, naturally and without the side effects. The use of LED blue light is highly effective in healing cystic acne by penetrating the skin and getting to the underlying infection causing the breakouts. Within three to four average 20- minute treatments, a reduction to just surface acne is achieved. A healthy, alternative route to medication. Lastly, the chin represents the hormonal area. In women it usually means that menstruation is approaching. In men, it also shows hormone imbalances. At some point, one may just grow out of it, but the oil of wild carrot, a flower, helps with hormonal imbalances. No matter what the face maps out for causes behind the breakouts, acne can be treated naturally and without the use of prescription drugs. If you or someone you know has concerns about their skin, call for a free consultation. dermatitis. Contact Dermatitis, 40(1), 53-54.